Safety is the number one reason for a well managed herbicide facility. Climate controlled storage buildings must be monitored regularly to ensure inventory is stable. Protecting against spills not only protects environments but also employees health, water quality, and company investments. A properly designed herbicide facility promotes safe storage, handling, and disposal practices to ensure worker safety and minimize the risk of worker or environment contamination. Proper storage of herbicides helps reduce employee and environmental hazards while reducing insurance liabilities for operating facilities. 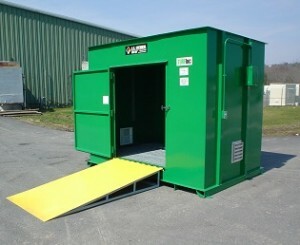 Herbicide storage buildings are recommended for storing flammable and non-flammable herbicide chemicals. Insulated, heated herbicide storage buildings may be needed if herbicides are subject to freezing. UL Listed heaters are designed for Class 1 hazardous locations and offer herbicide storage buildings with a climate controlled environment in colder months. Heated herbicide storage buildings are often necessary for northern states that have longer winters and for companies that store bulk amounts of herbicides. Storage buildings also provide protection to to keep container labeling inntact and legible when storing herbicides, pesticides, fungacides and other similar chemicals. Herbicide storage buildings are engineered for customization; therefore safety accessories such as mechanical ventilation can be added to these buildings to ensure optimal safety. Mechanical ventilation uses low-rate ventilation during non-occupancy to rid harmful toxic vapors from the building. Ventilation accessories also provide flammable chemicals with fresh air, to prevent combustion. To learn more about herbicide storage capabilities and to receive a free chemical storage consultation, contact US Chemical Storage online or call 800-233-1480. Utah State Cooperative Extension. Pesticide Storage Facility and Mangement Plan. Nov. 2003. Montana State University. Watch Winter Storage of Herbicides. August 23, 2005.